At Winter Wonderland they are taking a break from Christmas and the winter season for a few weeks, starting with a challenge of Fashion. 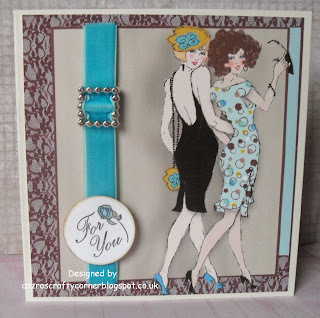 I love all cards to do with all styles of Fashion. 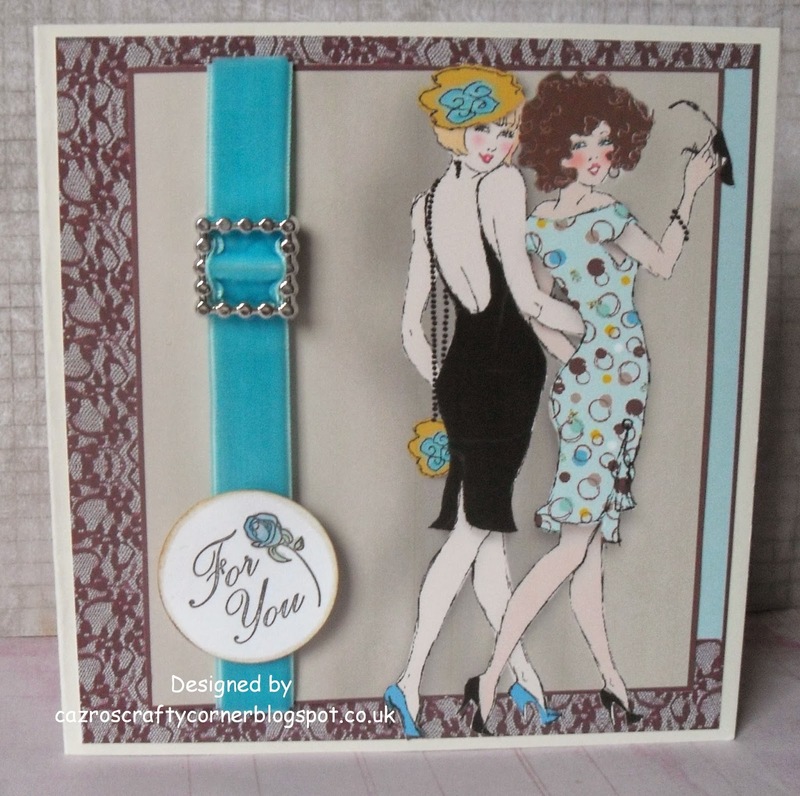 My card above has been made with an image and backing paper from Frou Frou CD from Crafter's Companion. I added a piece of turquoise velvet ribbon and a diamante ribbon slider. 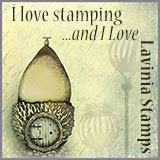 The sentiment is a stamp from Papermania. Thanks ladies, once again I have promised myself to make card for your challenges throughout the year, must ensure my Christmas cards are made often and regularly, but hey ho, I have said this the past two years. The coloured mat is from old stash. Hello everyone, well we at CD Sunday Challenges are back after a week's break, certainly has been an enjoyable time, getting ready for Santa, gifts passes and surrounded by family and friends. I do hope you have all had a similar wonderful time. Now we are back in business and Sue T has setting us the challenge to hoist the mas for 'We Are Sailing'. You all know the rules by now, some part of your project must be from at least one CD. Enjoy yourselves, sit down and have a nice craft break. Have fun looking for your boats or ships. special big Thank you to those who have left me comments. We are getting excited about the new Challenge blog to start on January 4th called Fantasy Stamping which is being started by my good crafting buddy Jan Brown. 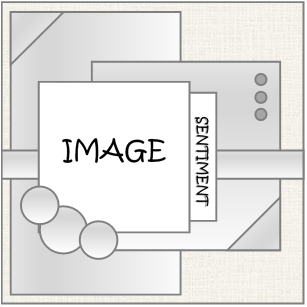 To keep her new Design Team busy she created the above sketch for us all to make a card to show in a preview. 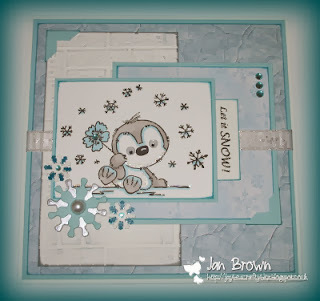 The card above was made by Jan, you can find out more information of the card and the new blog here. A very happy Christmas to everyone. A dear friend of mine Jan Brown will be opening her new blog in the coming new year. After she had recruited her Design Team she gave us each a challenge with a sketch to help to promote her countdown to the new blog. 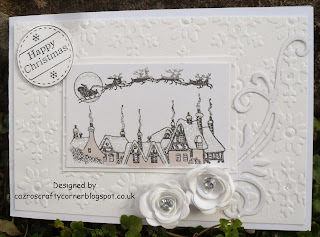 Today and for a few more days I am showing the wonderful card made by Sandra, please visit her blog which is full of wonderful creations. Keep watching there are 3 more to come. 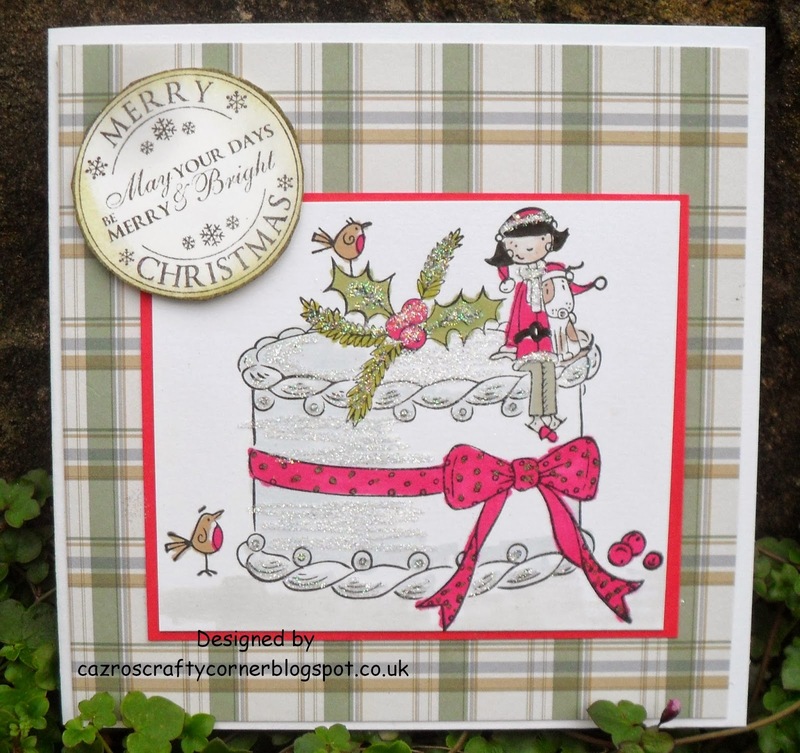 At My Time To Craft this week is for the last minute cards you may be needing. White on White - Christmas except for the main image which may be coloured. . I made a landscape C6 card that is in the UK a 6 inches wide by 4 inches deep, I know this size varies a lot in the US. Main Image - From my stash - unsure of make. At Alphabet Challenges we are nearing the end of our Annual Alphabet challenges. Our fellow DT Member Roxx is asking for the letter W - Whatever You Want. I saw this as my escape for a little while from making a Christmas Card. I watched Mels Heaton on C & C. TV making these wall hangers with MDF, but have found mount board a good product to practice on. 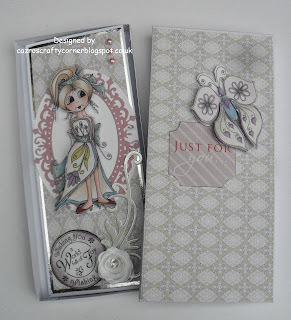 Butterfly stamp from now Chocolate Baroque. Well the world is your oyster, we expect anyone who is not wrapping presents will have fun joining in with a free for all Whatever You Want. At Fan-Tastic Challenges where you must be Square, we are this week challenging you to Anything Goes but you need to use some punches or dies or both. 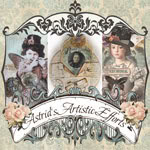 I just love this stamp from Crafty Sentiments, I so think she looks like a lady who appears regularly on Create and Craft. 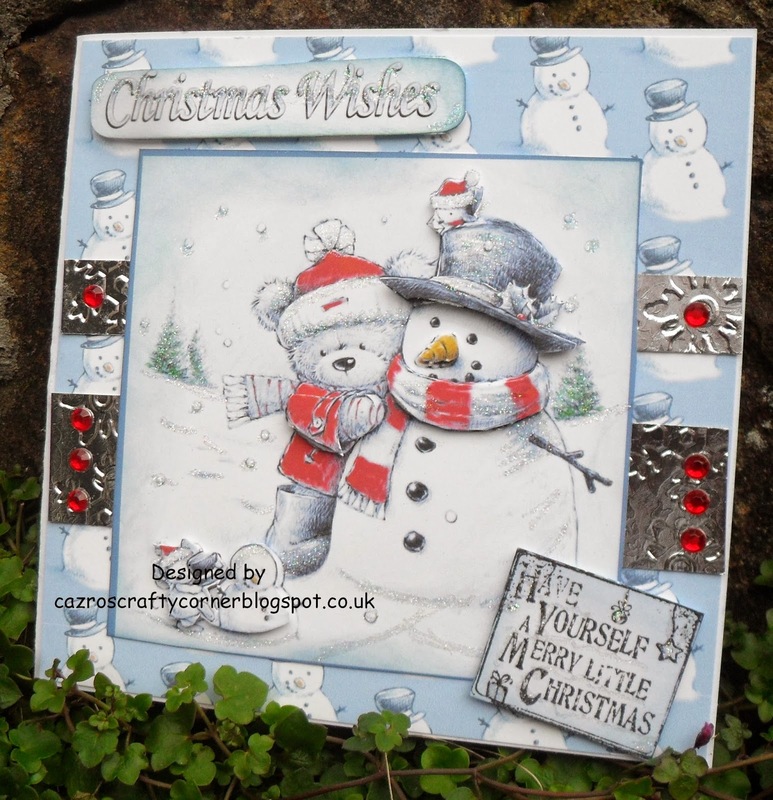 I greatly enjoyed watching the programme with Lynda from Crafting Creative World (Cupcake Designs) with the new CD Here Come the Girls, which is now at the top of my wish list (please Santa drop a few money notes down my chimney pot). I have had the pleasure and honour over the last three years to have been on a few Design Teams for various types of challenge blogs. I believe the time has come for me to venture into the world on another level by owning my very own challenge blog. I am ready to set the ball in motion. 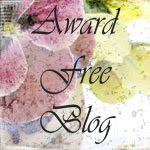 Please keep your fingers crossed for me, I will need a lot of good luck and hopefully the crafters in and around in blogland will like my blog. I am looking for a Design Team, if your interested please click above to find out how to go about it. All gently coloured onto tissue paper with Promarkers. Melted onto the candle. Sorry about the dirty mark on the left side, it is a shadow, the candle is actually clean (thanks goodness). As they say, 'Now For Something Different'. 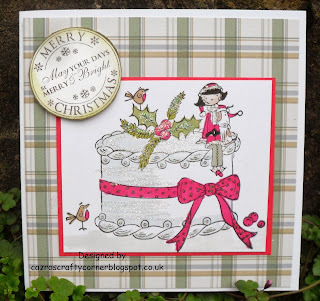 This week at CD Sunday Challenges, Carol has challenged us each to do 3 Ds - A D.L card, with Decoupage and to use Die cuts. Quite a mixture, to test you, well you did have a week of rest, of course we need to wake you up. LOL For my card I went to the lovely Flights of Fancy CD from Katy Sue, I so love the images, the colours, well everything about the CD really. i added a few die cuts as required, a small rose, also made from a die, then twirled around to make the flower. I decided as it wouldn't fit into the envelope I made a box, by drawing around the card and adding half an inch either side, scored and the corners cut and glued. I covered the box with the same pretty paper used on the card from the CD. Something different from a Christmas card too, I have made so many this year, lovely to have a change. 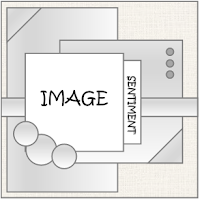 I look forward to seeing what you have made for Carol's theme this week. 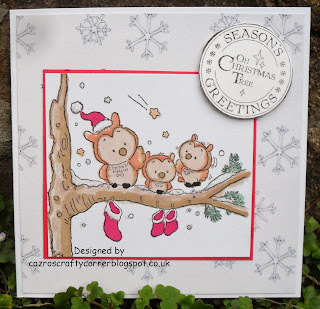 It's getting so close to Christmas, you've probably sent all of your cards out so hopefully you took some pics before they all went in the post, for at My Time to Craft this week we are challenging you to make a project with Christmas Birds, basically any birds will do as long as they are Christmas orientated with a Christmas design. 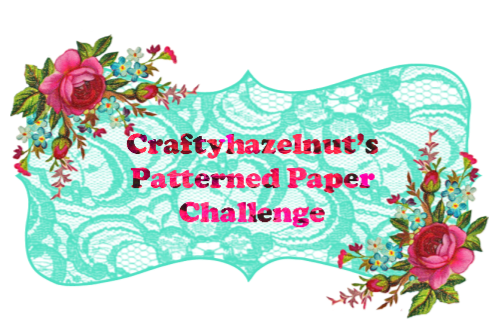 I used background paper from a Fizzy Moon paper pad. 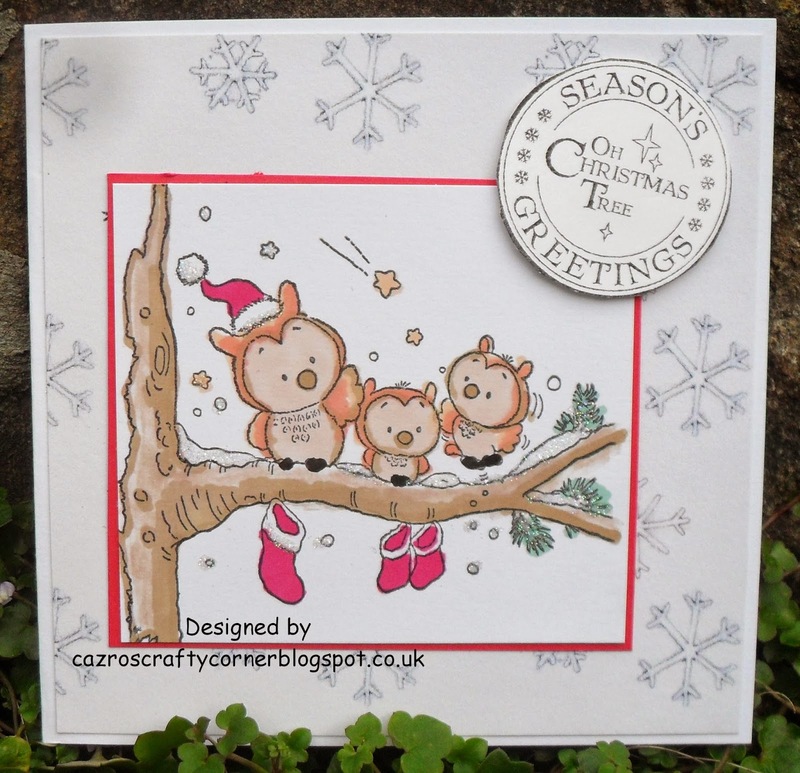 The stamp - Owls Christmas is from Crafter's Companions Mulberry Woods Designs. The sentiment is from LOTV. Have fun everyone, looking forward to visiting your blog. 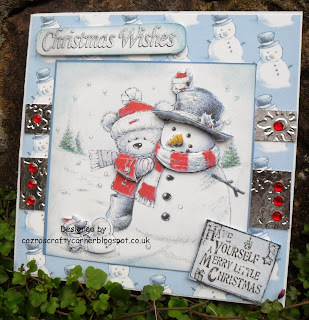 This week at Fan-Tastic Tuesday we are being challenged to ~Add Some Sparkle, a nice choice for a few weeks left to Christmas, here is another of my Christmas cards with Tulip and friends from Papermania/Do Crafts. I added lots of crystal Glamour Dust to the cake and holly, I am hoping you will see it if you enlarge the image. have fun everyone, remember our one and only main rule is ' It must be square - for it is Hip to be Square'. 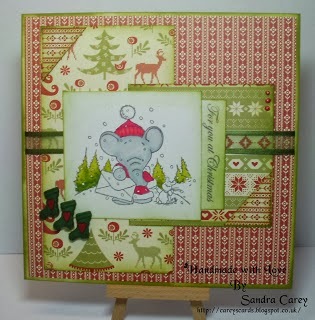 Time already for My Time To Craft the challenge this week is Cute and Cuddly Christmas with Animals. I know a Teddy bear isn't exactly politically correct, it not being an animal but who is going to slap my wrists for this faux par? I simply couldn't resist the cuteness of the image along with the papers from La Pashe The Best of 2012 CD. I added some embossed mirri card and red jewels to embellish. The lower sentiment is from LOTV. Have fun with the challenge, looking forward to visiting your blogs. Here we are at Alphabet Challenge up to letter V. Avril has chosen Vellum. 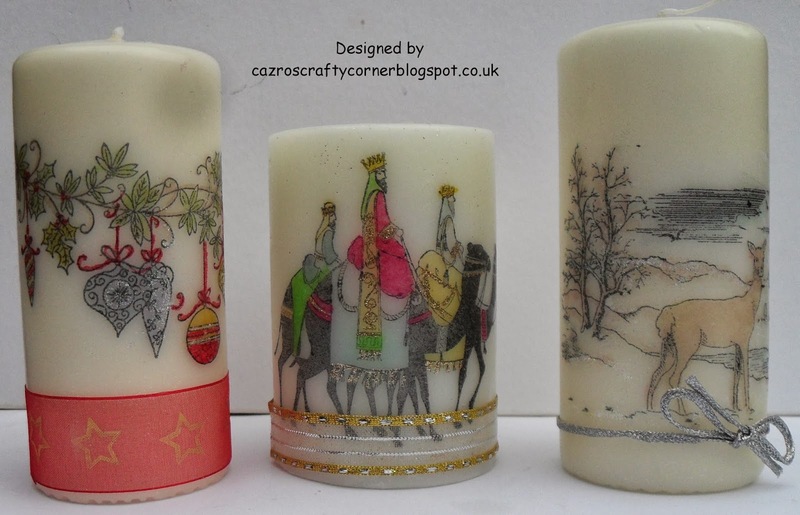 The piece of Vellum I have used is from a pack I bought forever ago from QVC when they used to do craft well. I only have pieces left now, but I know I will use them one day. 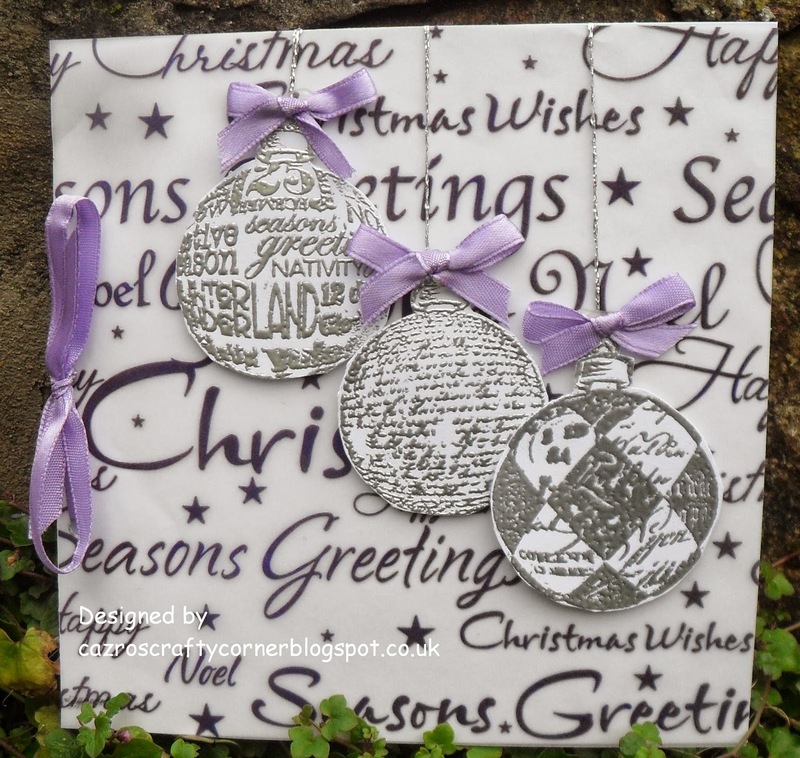 I also stamped three baubles from a Paperartsy stamp set, embossed with silver embossing powder. Strung them on silver thread. I made the added bows. 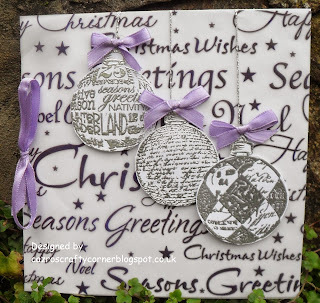 The vellum is positioned on the card with two punch holes at the side tied through with the ribbon and under the baubles with 3D foam which doesn't show. Have fun playing with your Vellum, there are so many ways it can be used. Looking forward to popping onto your blogs. 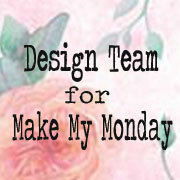 At Fan-Tastic Tuesday Challenges where it is Hip to be Square - we are going Clean and Simple. 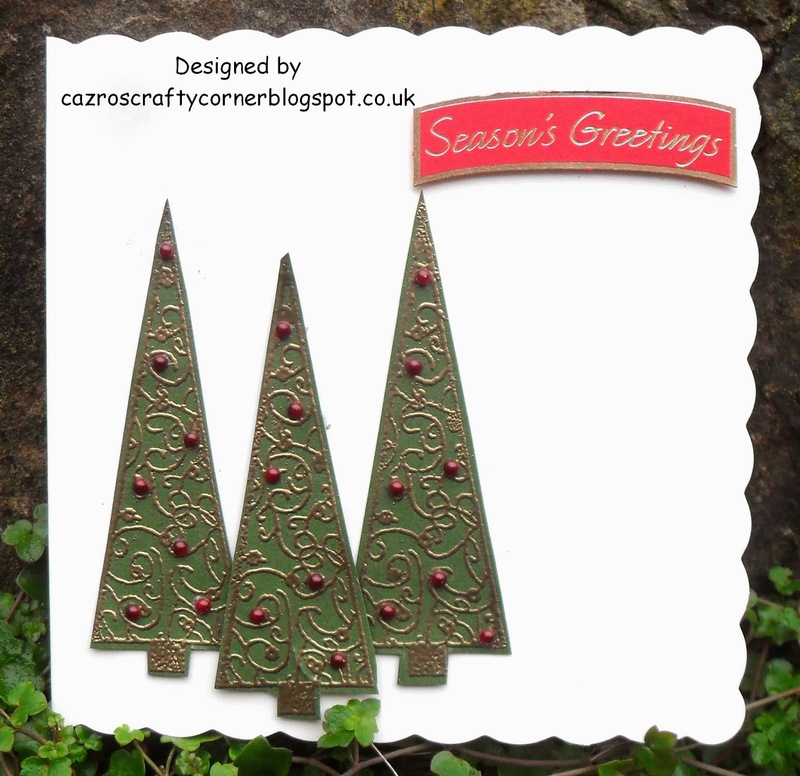 I have used a Dreamees stamp of a Christmas Tree. I was so pleased to see the mother and daughter duo on Create and Craft last week and have just read they will be on again during the first week in December. I stamped onto green card with Versamark and heat embossed with gold powder. Added a few red gems to decorate. I am sorry about the lack of light, this was taken early one morning but the light is not good at this time of the year. I look forward to seeing your CAS - Clean and Simple works of art- remember they must be Square. Are Any Of My Followers Interested In Scrap Booking? 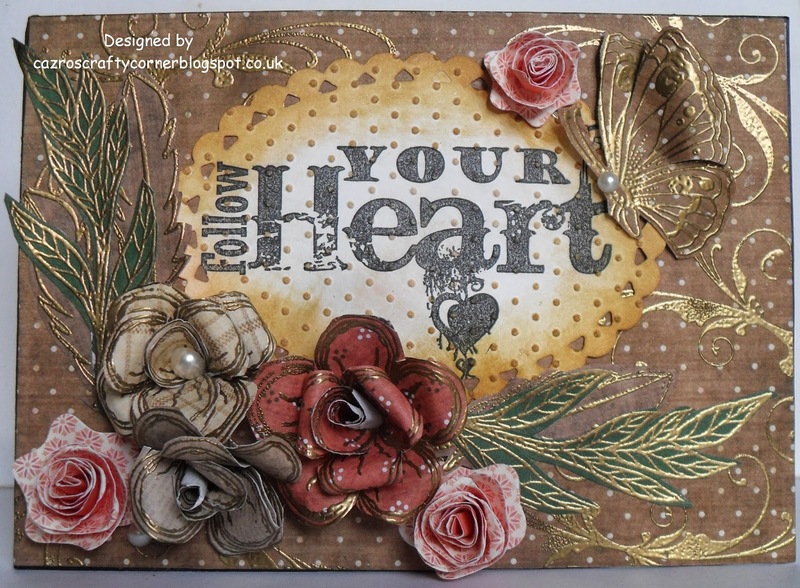 http://myscarpbookingcupboard.blogspot.co.uk/ this is where from today onwards I will be adding any scrapbook pages I make, any scrap book challenges I enter will be on my new blog.. 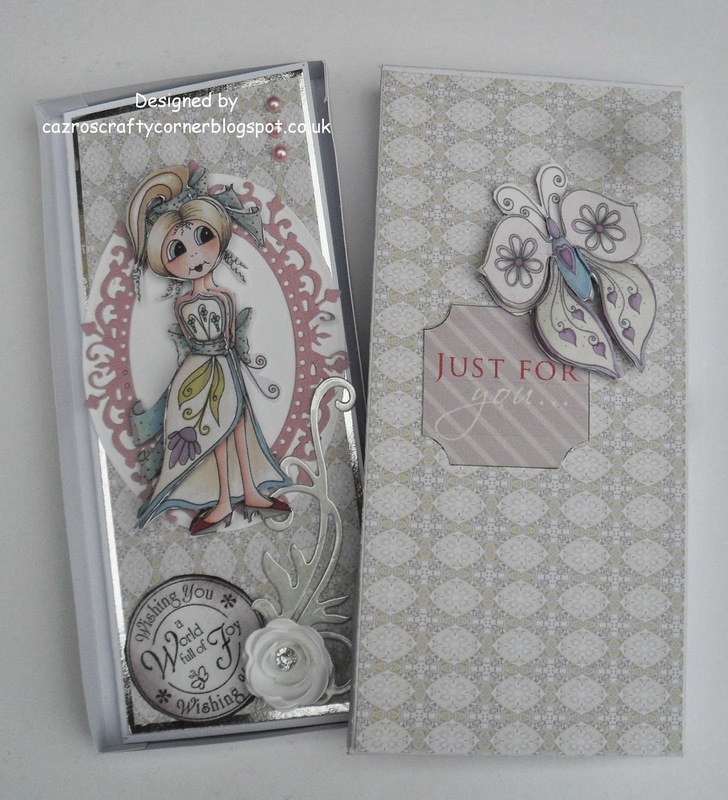 I will be keeping this blog purely for Papercrafting and card making. 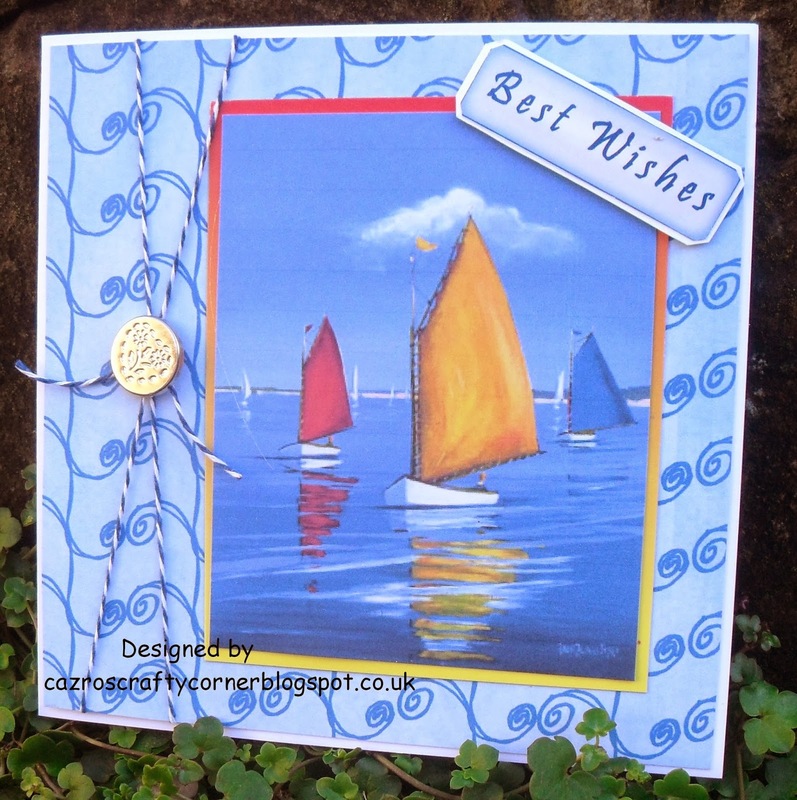 Please feel free to pop on and if you do like Scrap book pages I would love to see you as a follower. 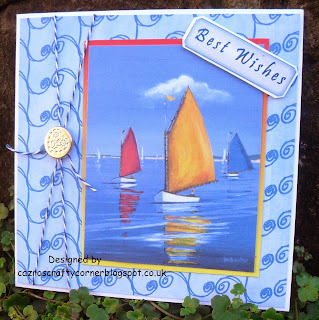 This week, at CD Sunday Challenges Beryl's challenge is Home Sweet Home. As our regulars know we are a challenge group which require you to use something from a CD or Craft DVD. 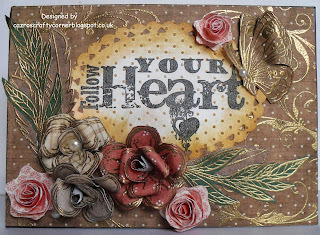 We mostly concentrate on cards, but, we crafters also know nowadays there are many extras on CD's which are helping us to become 'paper-crafters' as well as card makers. I adore these small birdhouses which are on the Flights of Fancy CD from Katy Sue. 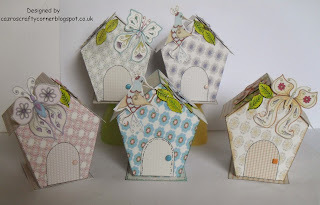 I have decided the next set I make, I will cut the doors so they will open and thread some ribbon through the pitch of the roof so they can be hung as well as being stood, then I could stuff them with sweets for added fun for my grandchildren, friends and family. 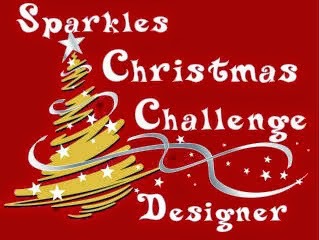 Have fun with the challenge ladies (and any gent's) I look forward to seeing your Home Sweet Home projects.